Ideas-to-Creation: make a little pencil sketch and then create! 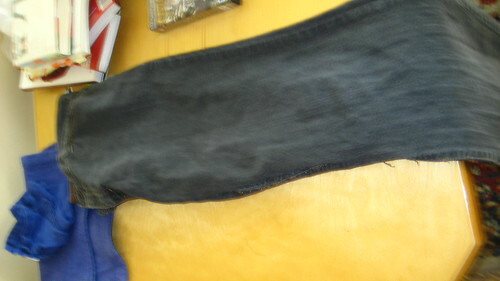 Worked on a landscaping gig, then a beach cover, and now, altering some old jeans to make a tulip-shaped jeanskirt. Done! Very happy with results. The plan- take old black worn jeans and turn into jeanskirt. Read a few blogs, vaguely remember doing this ages ago, and start ripping seams. Then get tired and stop for about a month. 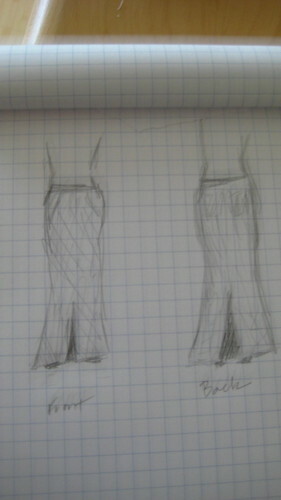 The jeans were always too high-waisted, so I’m dropping the waist a bit. Glad I don’t have to do a waistband, they aren’t fun. I’m excited because long skirts look good on my body type, which is long waisted, and the tulip flare will make me look more proportional. 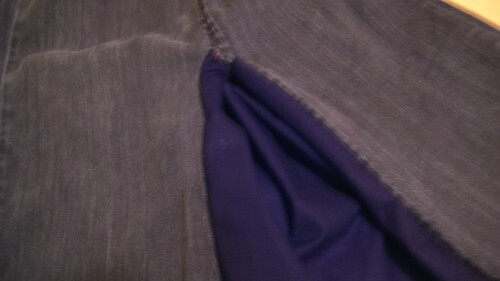 The only hard bit is: merging my seams with funky jeans seams, and the kickflap. I’m doing this without a pattern of course because that is how I roll. This looks vaguely dirty. I rip out and re-sew a few times. Hemmed the kickflap, pleated it inside and tacked to the side by hand, and voila! It’s nice and casual, and looks good with a t-shirt. I’m glad it worked out. I’m debating on top-stitching the kick flaps to push the black linen back farther, but may save that for another day. Written Monday, November 10th, 2008 in crafts. You can leave a response, or trackback from your own site. Very cute! might give that a try w/ some of my old jeans that I oughta just admit I'll never quite fit into again – as a skirt, I think they'd be much more forgiving. Maybe a surprise bit of funky fabric, or a swatch of wide elastic at the kick. hmmm…..